I had a student who suddenly became aware of her progress, and began to worry about how her efforts so far on the first ever year of flute lessons now measured up to all the other University flutists around her. I responded that the entire trick of it is to only compete with yourself. Record your lessons, record your rehearsals, and defintely, record yourself at the beginning and then again, at the end of a week of practice, and actually analyse for yourself what you're doing right and what you need to improve. For example, can you dance to the rhythm of your recorded etude or solo? Or does your rhythm make you groove, or do you find you have to hop skip and jump and even stumble a bit as you dance to your playing? Does that tell you something about your need to work on the meter or rhythm? How about intonation? What do you hear when you listen back? Why not record your etude or piece with the The Tuning CD playing the tonic drone for each section? And even if a piece isn't quite up to speed yet, you can still record it as an outline, playing a simplified version of the piece, even at full tempo. Outlining is playing only one (or more) notes per bar of music, in order to simplify it. down to a more manageable practice routine. problem area is NOT at the beginning. the complexity of the "fast notes". It's the musician's greatest invention. only one facet is worked on at one time. At first, you can outline any piece by just playing only the main notes, and leaving everything else out, but in time, and rhythmically. Later fill in the missing faster notes bit by bit. Click on jpeg to enlarge. Use back button to return. for easier and more comprehensive practicing. every quarter (2nd outline in sample above. )or every first and fourth note of four sixteenths, for example. Or you could outline only low notes, or only highest notes. Each outline creates a variation on the main melody; all are valid. You can hear me outlining Chaminade's Concertino and other fun recording experiments in coversation with author/pianist James Boyk in a 2009 interview here: Outlining explained on Jen's Fluteloops radio show no. 10. And one more thing to help us all feel better when or if we get the blues ( :>), check out what a wonderful quote I just found today. It's trying to be good, it has potential, but it's not. A lot of people never get past this phase; they quit. We know our work doesn't have this special thing that we want it to have. And if you are just starting out or you are still in this phase, you gotta know that it's normal and the most important thing you can do is do a lot of work. Put yourself on a deadline so that every week you finish one piece. It's only by going through a volume of work that you will close that gap, and your work will be as good as your ambitions. And I took longer to figure out how to do this than anyone I've ever met. It's normal to take awhile. You just gotta fight your way through. This is also oh so so true about music studies, as in any art form. We don't want to compete with others, but wish to find the best quality of work that completely engages us in our creativity and understanding. And when we find that, we can reach out and engage with other musicians, and then the growth becomes exponential. It was serendipitous that I found this quote through David Cutler's excellent "Saavy Musician" blog, where he had addressed a similar topic for young musicians in a blog post entitled "The Best in the World". You just have to see that it's the more squiggly line that is the true line of success. So hopefully my very artistic student will feel more relaxed knowing that we all go through this stage, and the answer is to create your own artistic standards for yourself. My gosh, I remember that stage extremely well from my own stages of flutey challenge. So, glad to share, and happy to help. So true! And I love the line drawing of success...I may have to use it myself some time! As for the taste/skill gap, I refer to that with my students as your brain being ahead of your body. Of course, that's where you want it to be, but it can be frustrating at times. I think that's especially true for adult amateurs. Thanks Zara. So true indeed. 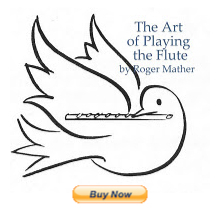 The book called "101 Inspirational Flute Stories" is one book that all of us read with relief. Yes it's true; the dips and drops in the success line are "normal" that's for sure. I have some great stories of my own about this, which I'll share sometime. Yes, adult amateurs often have tremendous taste and fantastic musical ears, but they can be parallizingly self-critical. It's a fine balance to have great ears, and yet patience and perserverance. Love to hear stories too!